By Eoin on 8 October 2010. During Christmas 1995, I decided to code myself a “personal webpage”. It was a one-page site. Of course, it had “under construction” dividers. On it, I wrote about myself (as I am doing now). Very selfish. Anyway, part of that was to write some Irish, as it seemed somehow fun to write about myself in two languages. The time between 1995 and 2002 is a bit of a blur. 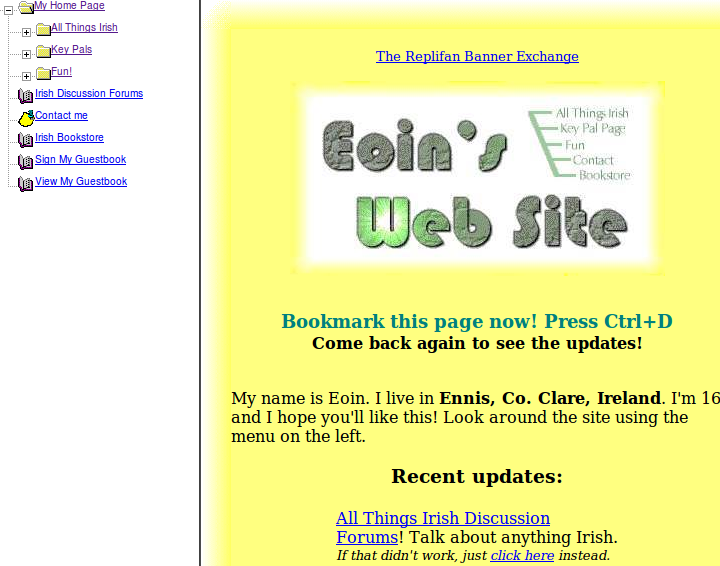 I remember that I did have a site “Eoin’s Fab Site”, which slowly formed to have a section called “All Things Irish”. That Irish section had a forum in it, probably by the late 1990s. The problem was, I was just a kid in school. I didn’t have any money, so was doing everything to find free hosting. As each free host disappeared, I would install a new forum all over again. In 2002, I finally bought a domain name, irishgaelictranslator.com. I made an announcement, and of course told everyone to register again. 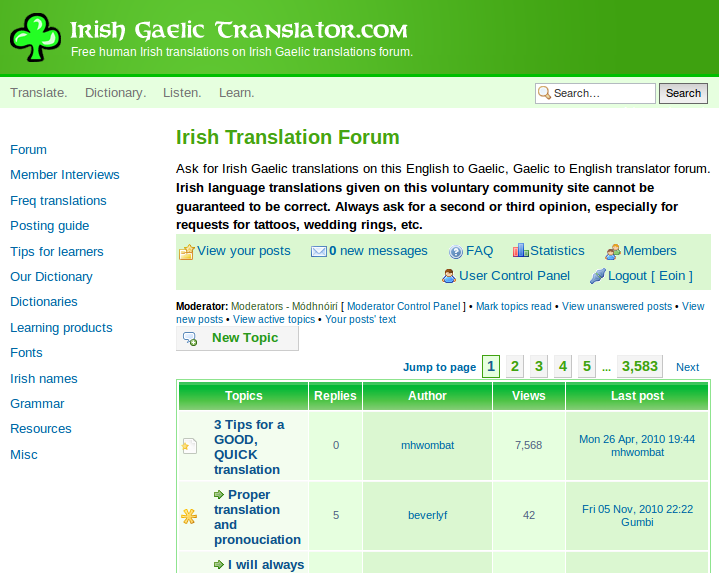 IrishGaelicTranslator.com Forum (known as IGTF to its regular members) finally had a permanent home to settle down in. (I should have chosen vBulletin in favour of phpBB, but oh well). 8 years on, and the forum has 60,000 members who have posted, and 700,000 posts. Today, for example, there have been 30 active threads. It’s not huge, but is nicely active considering its specific niche. Alont the way there were complaints of the original members as the forum grew bigger, as of course, there was less of a community feeling. Nevertheless, it’s still an active community with a very specific focus. IrishGaelicTranslator.com Forum as of 2010. IrishGaelicTranslator.com Forum was never divided into several forums. It was never referred to as “forums”. There was never doubt of where to post your message. You just posted your question into the forum. A bit of phpBB customisation made sure that you didn’t see a ‘forums index’. Forums are still obviously very popular across the web. As far as I can tell, they are still the de facto way of setting up an active community. The problem is, most forum software are hard-coded to have multiple forums. The more sub-fora the merrier! Surely not, for any modestly-sized community that has a specific focus. You don’t know what to post where. The person setting up the web site either created lots of specific forums trying to pre-empt your question, or they’ve divided in to, say, three generic forums that are so general you still don’t know where to post. Forums get stagnant. Take Irish Webmasters Forum as an example. It’s a great place to meet fellow Irish webmasters. The downside: it has links to 35 different forums on their forum index. Where the hell should I post my question? When I was browsing a specific sub-forum a few months ago, the last thread was a month old. Despite the site having the perfect audience, asking my question in the forum would probably only been seen by a handful of people. Ultimately, it divides your community. By taking the single-page approach, everyone focuses on one single forum page, everyone sees each request, and everyone knows where to post. Unless your forum is hugely popular, I think you’re doing people a favour by keeping everything on one page. People skim content and choose what to read and ignore. I do the same with news site: skim the headlines and read what I want. I don’t click into each of their news sections just to see what’s going on in the world. Reddit is a good example of this. They have a single page of news items. To deal with the many many links that are submitted, you can still choose to drill down into sub-reddits. But for a smaller site, even that step wouldn’t be needed. I’ve had the single-page forum for 8 years now, and wouldn’t have it any other way. There are other multi-forum sites I have set up since (especially), but that was due to lack of time to customise the software. The trick is that you need time to set up a custom single-page forum. If you run a community forum, or are a member of one, let me know what you think about the merits of this approach.